I wonder if she had bangs. 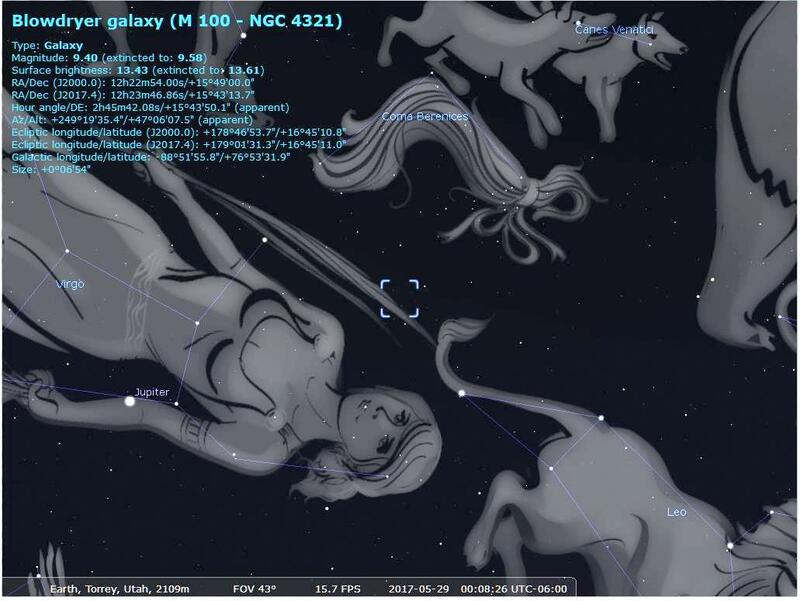 The constellation Coma Bernices is named in honor of Berenices II of Egypt, who was the queen of Ptolemy III (246 – 221 BC). The queen vowed to sacrifice her acclaimed amber tresses in the temple of Aphrodite at Zephyrium following the king’s safe return from battle. After her golden locks mysteriously disappeared from the temple, the court astronomer Conon apparently made peace by convincing the royal couple that the lost sacrifice had been transformed by the gods and made into an eternal constellation. Perhaps kings then, like president trumps today, required constant creative handling. Trump might think it handy to have a blowdryer galaxy all his own for his special headdress. 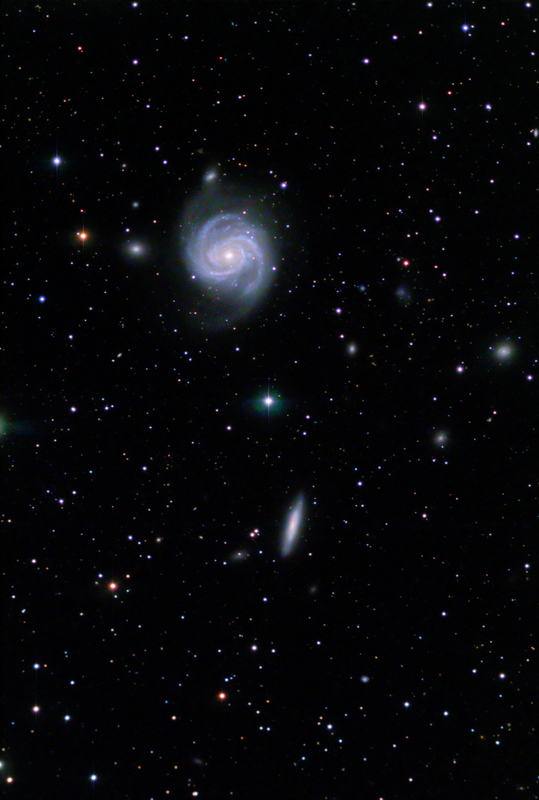 M100 and NGC 4312 are members of the Virgo Cluster of galaxies in constellation Coma Berenices, 50 million light years from earth. M100, also known as the Blowdryer Galaxy, is the upper galaxy seen face on, NGC 4312 is a spiral galaxy seen edge on. There are several other small dwarf galaxies also in the image. This image is one of my first relative successes with the CCD camera that Dad has in the observatory. A CCD camera is monochrome. In between the camera and telescope is a automated filter wheel with clear (luminance), red, green, and blue filters. In a typical photo acquisition session then a series of shots are taken using the LUM, red, green and blue filters. Each series is subsequently processed separately then combined in stacking software before being finally combined and processed in Photoshop. This compares to a DSLR one-shot color camera where the luminance and color is all acquired at once. The CCD images therefore require something like four times the processing thereby allowing beginners like me four times the opportunity to add errors. I amply indulged in those opportunities. This image is a total of about three hours of exposure made up of 18 X 5 minute LUM subs, and 6 X 5 minute red, green, and blue filters, all unbinned (1X1). This entry was posted in Astrophotos, backyard observatory, Star Stories and tagged M100, NGC 4312 on May 28, 2017 by Mark Bailey.